Home » What Are the Different Types of Warehouse Storage Systems? There are many ways to stack pallets in a warehouse, some more efficient and safe than others. Which one you choose will depend on the stock you deal with now and any you might work with in the future. Stock stacking systems can be combined and more than one system can be used under the same roof. The benefits of picking the right warehouse storage system include an improved use of space, easier work processes and better overall business efficiency. Therefore, it’s important to choose the right one or the right combination for your particular business. Different warehouse storage systems come with different benefits and different problems and will not suit all applications. The following 10 systems are among the most common, though this is certainly not a comprehensive list. If you need expert advice on what will suit your situation and plans, give us a call on 0800 085 8117 or send us a message a using our contact form and a member of our team will get back to you. Automated storage systems enable items to be stored and retrieved by a computer-controlled mechanical arm device. These systems are ideal for easily retrieving smaller items that may take a human picker time to locate. Archive storage containing thousands of books or documents would benefit from this type of system. A problem side to automated storage would be the potential for computer or mechanical failure resulting in an inability to access your goods. One positive aspect would be safety as there is no need for a worker to climb to retrieve goods. 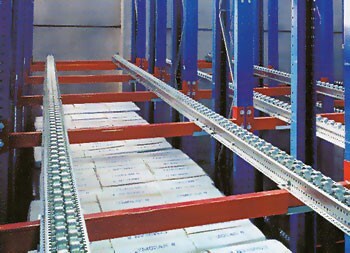 Compared to some other systems, pallet racking can be a much cheaper and efficient option. By storing numerous pallets in a framework it is possible to access any particular pallet at any time without the potential failures involved with other systems. Human pickers with ladders or forklift trucks can access stock located anywhere in the warehouse. Pallets can be stacked as high as is safe which is determined by the racking design and stability. 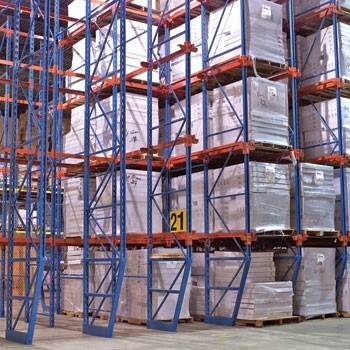 Find out more about pallet racking here. Block stacking is the most basic form of storage where either individual items or pallets are placed on the floor and stacked on top of one another. Usually organised in lanes or blocks so that each item can be accessed, this is the simplest and cheapest form of storage as there is no investment in racking and can be operated in any open warehouse floor space. Works on a conveyor belt system, usually within a pallet racking framework. The conveyor belts allow for heavy goods to be more easily moved which means that forklifts, which might normally be required to shift the goods, won’t be needed. The real benefit of a pallet flow system is that a picker can be stood in one spot to unload goods. Once the first container has been emptied, then next container will automatically travel down the conveyor ready to be picked. The obvious downside is that goods in the middle of the system are much harder to reach. Push back storage works within a pallet racking framework but operates more like a vending machine. The next product moves to the front once the first has been removed. This is often on a much larger scale than the pallet flow system and requires the use of forklifts. The downside being that you can’t always access goods in the middle of the system. This system is best used for goods that will be loaded and unloaded at the same time so that it is unlikely you will ever need to access one container in the middle of the system. A picking area is set up for the ease of an individual or a team of pickers. Goods may be stored around a central area where they can be easily located. This is ideal for smaller items and is not well suited to large goods or goods that might be stored at an excessive height. Ideal for items such as pharmaceuticals. Items are stored in a carousel system which is accessed from one place. The stored products are continuously monitored using the integrated automated system. When a product is required, the entire storage system automatically moves to where this product is. An additional storey of flooring within an existing structure. Within this structure, many of the above systems can be utilised. Depending on the size of the space available, a mezannine floor can even double the storage space previously available. 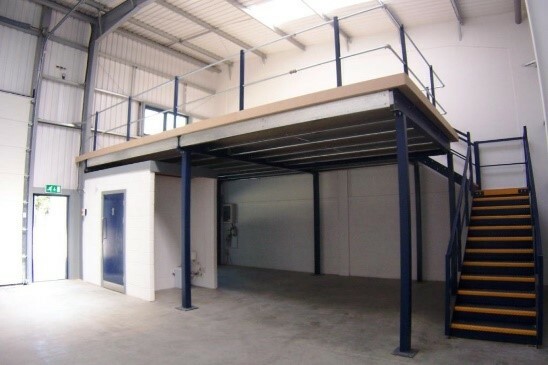 Find out more about mezzanine flooring here. This type of warehouse storage system utilises vertical height and is ideal for improving pallet density. 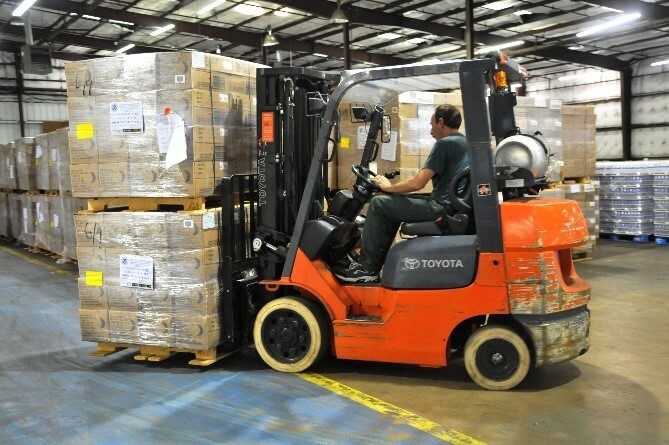 Pallets are stored two rows deep instead of one so a reach truck or articulated forklift is required to reach the higher pallets. Double deep racking can improve storage for up to 15% depending on the layout of the warehouse. This works on a first in, last out rotation basis where pallets are stored back to back. This storage solution is perfect for companies who need to store large quantities of the same stock. Drive in racking is great for optimising the space in your warehouse without requiring any specialist handling equipment. The downside can be that the limited space for manoeuvring a forklift can increase the time taken to load and unload stock. To receive a realistic and accurate cost for your pallet racking requirements, our expert team at Pallet Racking Systems are happy to discuss your requirements with you and put together a proposal to meet your needs. For more advice on which warehouse storage system will suit your business needs, call us on 0800 085 8117 or send us a message a using our contact form and a member of our team will get back to you.